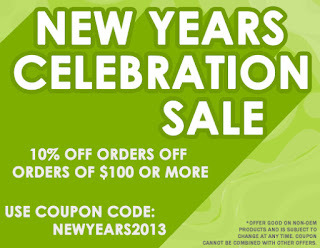 TonerGreen New Year's Celebration Sale - Save 10% Off Orders Of $100 or More | TonerGreen - Eco-Friendly Toners from the U.S.
2013 had already started and to celebrate this TonerGreen, your provider of eco-friendly printer supplies is offering everyone a 10% off discount on all orders $100 or more as a part of our New Years Celebration Sale. 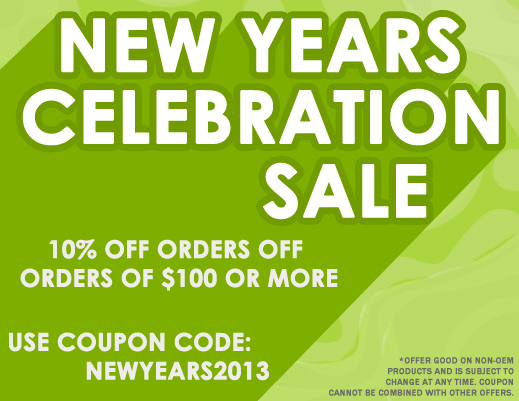 Save on your order eco-friendly, U.S.-made remanufactured toner cartridges and ink cartridges by just typing in coupon code NEWYEARS2013 at the designated coupon code box to be found at the checkout page. This will automatically apply the discount on your order. As always, orders $50 and up qualify for free shipping, thus with our New Years Celebration Sale, your shipping will be free as well. This promo is valid until January 10 and is not valid on OEM products nor be combined with other coupon codes or on-going promotions. So what are you waiting for? Enjoy a greener 2013 by using eco-friendly printer cartridges in everyday printing. Aside from this promo, TonerGreen also gives a 10% off discount on orders $50 or more by simply liking TonerGreen's Official Facebook Fan Page and redeeming the special coupon code to get the discount. We also offer a 10% Off $300 Order Deal, an all-year around discount promo for customers whose purchased order will reach the amount of $300 or more. To avail this discount just use coupon code TENOFF300. Shipping is free, of course, in this promo. You can also check TonerGreen Coupons Page for more discounts and promos. TonerGreen's primary product line includes U.S.-made remanufactured toner cartridges and remanufactured inkjet cartridges compatible to known printer brands such as HP, Brother, Canon, Dell, Samsung and Xerox. We take pride in the superior performance of our products compared to the average compatible or remanufactured cartridges found anywhere in the internet. This is because quality is strictly imposed every step of the remanufacturing process until our products are either picked up by customers or shipped to their address. Our products are all eco-friendly, with the intention of contributing to energy conservation, sustainability, and environmental responsibility.